New style block puzzle game. "HalloPop"
You should stop increasing monsters on Halloween day. 1. Simple control. Gesture control is simple and funny. Cutting the increase path of monsters will make you clear stages more fast. 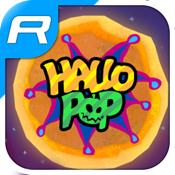 "HalloPop" is 60 seconds game. Try not to break your combo. Sweep faster and faster in the candy time to get big scores. 3. Use powerful items efficiently. You can overcome a crisis with items. Also items are very useful to get big scores. Play on facebook with friends and get the of top the rank.Invite friends and get more candy.